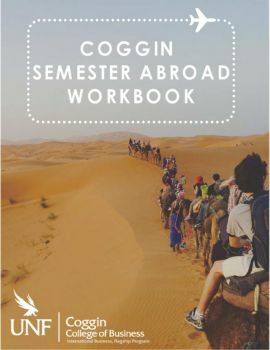 Refer to the Coggin Semester Abroad Workbook for detailed information! *For study abroad opportunities outside of the Coggin College of Business, visit the UNF International Center. **If you are a Coggin student requesting to receive credit for a non-Coggin study abroad program, meet with a Coggin Academic Advisor (Bldg. 10, Rm. 1350) to submit a waiver of college policy. Apply for your semester exchange by March 15 for Fall Semester Exchange and September 15 for Spring Semester Exchange. Attend your MANDATORY Pre-Departure Orientation and complete the necessary semester exchange paperwork (your study abroad advisor will send to you in advance). Register through myWings for the XCH4000/6000 placeholder course for your semester abroad. Your study abroad advisor will send you the CRN number and instructions on how to register. Work with your study abroad advisor, Alyssa, to determine your course schedule during your semester abroad. She will help determine how your courses will count towards your degree and she will go through the course approval process with Coggin Department Chairs. Complete the first page of your Learning Agreement with Alyssa. Meet with a Financial Aid Coordinator to determine how your financial aid will work during your semester abroad. Make an appointment with the International Center, to work on your visa process and international health insurance. Apply for/find housing abroad & purchase flight. These are to be done independently. Register for courses at your host university (some universities require you to do this prior to arrival). Complete and sign the second page of your Learning Agreement. Alyssa will send you the learning agreement around the second week of your classes abroad. Financial aid will be disbursed once the Learning Agreement has been completed and received by Financial Aid. Stay connected with UNF and inspire others to go abroad by posting pictures to Instagram, Twitter, and Facebook using #CogginAbroad. Contact your academic advisor about registering for UNF courses next semester. Contact Coggin Academic Advising. Register for UNF courses through myWings for your next semester at UNF. Fill out the Re-Entry Feedback Form at the end of your semester abroad. Bring the form with you to the Re-Entry Workshop or email it to Alyssa. Attend your MANDATORY Re-Entry Workshop. Alyssa will contact you while you are abroad to inform you of the date. Once your transcript from abroad has been processed and your degree evaluation has been updated, make sure that everything is correct. Come to the International Business Flagship Office (Building 10, Room 2125) to pick up your official transcript.